Are you tired of boring, white colored Lightning cables? Charge your electronic devices in style with the Thermal Color Changing MFi-Certified Lightning Cable. Instead of the plain white, these cables are made out of leather and change colors depending on the temperature. For a limited time, you can get one of these Thermal Color Changing MFi-Certified Lightning Cable for 56% off. Each one of these Thermal Color Changing MFi-Certified Lightning Cable is 6 feet in length and wrapped in vegan leather. The material is carefully selected and designed to ensure you get the best lightning cable on the market. Plus, there's a one-year manufacturer warranty on every Thermal Color Changing MFi-Certified Lightning Cable sold. They are compatible with all lightning port equipped devices. 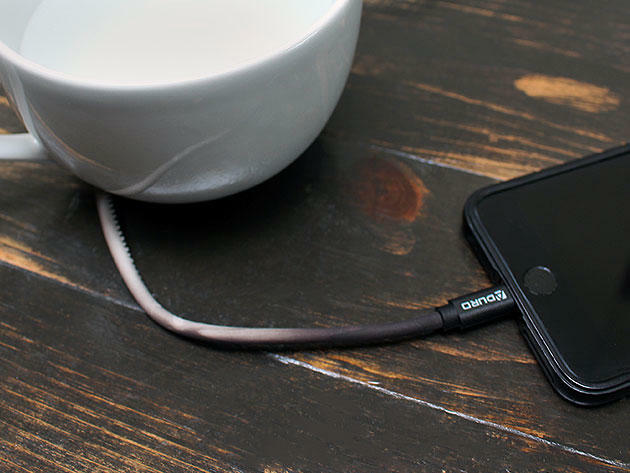 As MFi-Certified, these lightning cables are ensured to provide a fast charge and sync. Don't wait any longer. Get the Thermal Color Changing MFi-Certified Lightning Cable for $12.99. That's 56% off the original price.